Route 66 has the best, lightweight cargo jacket for spring on the block, and it's $29.99 (before discount). And it has neon pink piping on the zipper. Need I say more? 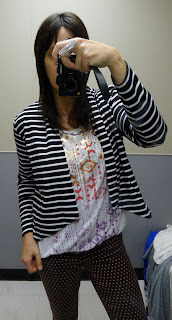 The striped jacket below is Attention, but the T is Route 66. I'm a little obsessed with some Attention pieces, also. Kmart is killing it for spring. Bonus: all the Route 66 is now 30% off. That's 30% off their adorable T-shirts (regularly $14.99). I cannot pass on their denim shirt, so basic, but so perfect. The cut is awesome, people and the price is great (now $13.99). Forever I've been thinking I need a basic black mini to wear in the winter with leggings, and in the summer as a beach cover up, etc. Voila, the Route 66 pull-on black cotton mini for $9.99 (reg. price), below. Get the crochet top for a spring/summer layering item, comes in black, too.